This article is about the island country. For the island on which it is located, see Saint Martin. For the village of Sint Maarten in North Holland, see Sint Maarten, North Holland. For the French collectivity, see Collectivity of Saint Martin. For the feast, see St. Martin's Day. the island of Saint Martin. Sint Maarten (Dutch pronunciation: [sɪnt ˈmaːrtə(n)]) is a constituent country of the Kingdom of the Netherlands in the Caribbean Sea. 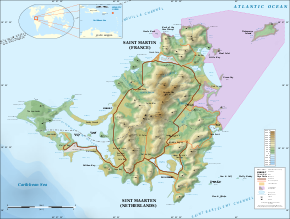 With a population of 40,120 on an area of 37 km2 (14 sq mi), it encompasses the southern 40% of the divided island of Saint Martin, while the northern 60% of the island constitutes the French overseas collectivity of Saint-Martin, the only place that France borders the Netherlands. Sint Maarten's capital is Philipsburg. On 6 and 7 September 2017 the island was hit by Category 5 Hurricane Irma, which caused widespread and significant damage to buildings and infrastructure. Sint Maarten has the 14th largest GDP per capita in the world (including territories) when measured by purchasing power parity, over three times as high as its French counterpart. The French and Dutch, on the other hand, both coveted the island. While the French wanted to colonize the islands between Trinidad and Bermuda, the Dutch found San Martín a convenient halfway point between their colonies in New Amsterdam (present day New York) and Brazil. With few people inhabiting the island, the Dutch easily founded a settlement there in 1631, erecting Fort Amsterdam as protection from invaders. Jan Claeszen Van Campen became its first governor, and soon thereafter the Dutch West India Company began its salt mining operations. French and British settlements sprang up on the island as well. Taking note of these successful colonies and wanting to maintain their control of the salt trade, the Spanish now found St. Martin much more appealing. The Eighty Years' War which had been raging between Spain and the Netherlands provided further incentive to attack. Spanish forces captured Saint Martin from the Dutch in 1633, seizing control and driving most or all of the colonists off the island. At Point Blanche, they built what is now Old Spanish Fort to secure the territory. Although the Dutch retaliated in several attempts to win back St. Martin, they failed. Fifteen years after the Spanish conquered the island, the Eighty Years' War ended. Since they no longer needed a base in the Caribbean and St. Martin barely turned a profit, the Spanish lost their inclination to continue defending it. In 1648, they deserted the island. With St. Martin free again, both the Dutch and the French jumped at the chance to re-establish their settlements. 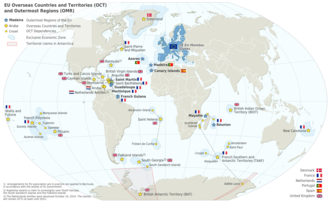 Dutch colonists came from St. Eustatius, while the French came from St. Kitts. After some initial conflict, both sides realized that neither would yield easily. Preferring to avoid an all-out war, they signed the Treaty of Concordia in 1648, which divided the island in two. During the treaty's negotiation, the French had a fleet of naval ships off shore, which they used as a threat to bargain more land for themselves. In spite of the treaty, relations between the two sides were not always cordial. Between 1648 and 1816, conflicts changed the border sixteen times. The entire island came under effective French control from 1795 when Netherlands became a puppet state under the French Empire until 1815. In the end, the French came out ahead with 53 km2 (20 sq mi; 61%) against 34 km2 (13 sq mi; 39%) on the Dutch side. With the new cultivation of cotton, tobacco, and sugar, the French and the Dutch imported a massive number of slaves to work on the plantations. The slave population quickly grew larger than that of the land owners. Subjected to cruel treatment, slaves staged rebellions, and their overwhelming numbers made it impossible to ignore their concerns. In 1848, the French abolished slavery in their colonies including the French side of St. Martin. Slaves on the Dutch side of the island protested and threatened to flee to the French side to seek asylum. The local Dutch authorities then freed the colonies' slaves. While this decree was respected locally, it was not until 1863 when the Dutch abolished slavery in all of their island colonies that the slaves became legally free. After abolition of slavery, plantation culture declined and the island's economy suffered. In 1939, St. Martin received a major boost when it was declared a duty-free port. In 1941, the island was shelled by a German U-boat during World War II. The Dutch side began focusing on tourism in the 1950s, with the French side following suit two decades later. Because of being split up into a Dutch and a French part, the tourist boom was heavier on Sint Maarten than on the surrounding islands. Its Princess Juliana International Airport became one of the busiest in the Eastern Caribbean. For much of this period, Sint Maarten was governed by business tycoon Claude Wathey of the Democratic Party. The island's demographics changed dramatically during this period as well. The island's population increased from a mere 5,000 people to around 60,000 people in the mid-1990s. Immigration from the neighbouring Lesser Antilles, Curaçao, Haiti, the Dominican Republic, the United States, Europe, and Asia turned the native population into a minority. Sint Maarten became an "island territory" (eilandgebied in Dutch) of the Netherlands Antilles in 1983. Before that date, Sint Maarten was part of the island territory of the Windward Islands, together with Saba and Sint Eustatius. The status of an island territory entails considerable autonomy summed up in the Island Regulation of the Netherlands Antilles. The island territory of Sint Maarten was ruled by an island council, an executive council, and a Lieutenant Governor (Dutch: gezaghebber) appointed by the Dutch Crown. On 5 September 1995, Hurricane Luis hammered the islands causing extensive damage 35 years to the day after Hurricane Donna. Then 22 years and one day later, September 6, 2017, the island was hit by category 5 Hurricane Irma which caused widespread devastation. In 1994, the Kingdom of the Netherlands and France signed the Franco-Dutch treaty on Saint Martin border controls, which allows for joint Franco-Dutch border controls on so-called "risk flights". After some delay, the treaty was ratified in November 2006 in the Netherlands, and subsequently entered into force on 1 August 2007. Though the treaty is now in force, its provisions are not yet[when?] implemented as the working group specified in the treaty is not yet installed. On 10 October 2010, Sint Maarten became a constituent country (Dutch: Land Sint Maarten) within the Kingdom of the Netherlands, making it a constitutional equal partner with Aruba, Curaçao, and the Netherlands proper. Sint Maarten has been assigned the ISO 3166-1 alpha-2 country codes of SXM and SX, and the .sx Internet ccTLD became available to register on 15 November 2012. The combined population of the two territories has continued to grow, albeit at a slower rate, and as of (2013) stands at around 75,000. Hurricane Irma made landfall on 6 September 2017, causing extensive damage. 4 deaths and 34 injuries, of which 11 seriously, were reported. Princess Juliana Airport was extensively damaged but reopened on a partial basis in two days to allow incoming relief flights and for flights that would take evacuees to other islands. By 8 September, "many inhabitants [were] devoid of basic necessities" and looting had become a serious problem. Reports on 9 September indicated that 70% of the infrastructure on the Dutch part had been destroyed. A survey by the Dutch Red Cross estimated that nearly a third of the buildings in Sint Maarten had been destroyed and that over 90 percent of structures on the island had been damaged. The Prime Minister of the Netherlands told the news media on 8 September that the airport in Sint Maarten was ready to receive emergency flights and that aid, as well as police officers and military personnel, were on their way. The Prime Minister of Sint Maarten had already asked the Dutch government for extended relief assistance which began to arrive on 8 September. The government issued a Tropical Storm Warning on 8 September since the Category 4 Hurricane Jose was approaching. The government of the Netherlands was sending aid, as well as additional police and military, since looting was a serious problem. A statement by the Prime Minister summarized the situation on 8 September. "We've lost many, many homes. Schools have been destroyed. We foresee a loss of the tourist season because of the damage that was done to hotel properties, the negative publicity that one would have that it's better to go somewhere else because it's destroyed. So that will have a serious impact on our economy." At the time, preparations were being made as Hurricane Jose approached the island. Government estimates on 9 September indicated that 70 percent of houses were badly damaged or destroyed; much of the population was living in shelters pending the arrival of Jose. Thankfully, this second hurricane did not have a significant impact on the island. Widespread looting had started and a state of emergency was announced; some 230 soldiers from the Netherlands were patrolling. Additional Dutch troops were expected. By 10 September, some 1,200 Americans had been evacuated to Puerto Rico from Sint Maarten by military aircraft during a time of looting and violence. On that date, Royal Caribbean International said that the company was sending its Adventure of the Seas to Saint-Martin and to St. Thomas to provide supplies and to offer evacuation services. The ship arrived on the island on 10 September with water, ice, garbage bags, clothing and canned food, and evacuated 320 people. By 11 September, King Willem-Alexander had already arrived in Curaçao and was scheduled to visit St. Maarten, St. Eustatius and Saba. When King Willem-Alexander visited Sint Maarten for the first time post-hurricane, he was shocked by the destruction. He immediately called for support from the European Union so the island could recover swiftly. Later in the month, it was revealed that the EU would allocate €2 billion in emergency funds for immediate disaster relief to restore basic essentials on Sint Maarten, such as drinking water and sanitation . In addition to the EU's contribution, Red Cross, the government of the Netherlands, and Dutch citizens of the mainland pitched in (via donations and crowdfunding) to raise money for the devastated island . On 10 October 2017, Princess Juliana International Airport recommenced commercial flights using temporary structures, pending repairs. A report in late March 2018 indicated that the airport was able to handle some flights and some service had resumed from the US, Canada and Europe. A new departure lounge was being used during rebuilding of the original facility. The General Aviation building was being used for passengers arriving on the island. A little over a year after Hurricane Irma, St Maarten’s cruise industry had recovered to the extent that in 2018, more than 1 million cruise passengers visited the island. Telecommunications, including Wi-Fi had been restored on the island, 95% of customers were receiving electricity and drinking water was readily available on the island. Some tourist accommodations were open, with 27 operating and 36 said to be ready some time later this year. Cruise ships were arriving; a full 14 were accommodated the week of February 18, 2018. The Constitution of Sint Maarten was unanimously adopted by the island council of Sint Maarten on 21 July 2010. Elections for a new island council were held on 17 September 2010, since the number of seats was increased from 11 to 15. 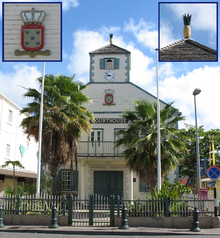 The newly elected island council became the Estates of Sint Maarten on 10 October. Eugene Holiday was appointed as the first Governor of Sint Maarten (Dutch: gouverneur) by the Council of Ministers of the Kingdom of the Netherlands in September 2010. He also assumed office on 10 October 2010. In 1978, the government of the Netherlands Antilles installed a Research Committee on the Windward Islands (Dutch: Commissie van Onderzoek Bovenwindse Eilanden) to investigate claims of corruption in the island government. Even though the report issued by this commission was damaging for the island's government, measures were not put into place to curb corruption, arguably because the government of the Netherlands Antilles depended on the support of Wathey's Democratic Party in the Estates of the Netherlands Antilles. In August 1990, the public prosecutor of the Netherlands Antilles started an investigation into the alleged ties between the island government of Sint Maarten and the Sicilian Mafia, and in 1991 the Court of Audit of the Netherlands Antilles issued a report which concluded that the island government of Sint Maarten was ailing. In the government and parliament of the Netherlands, the call for measures became louder and louder. With Dutch pressure, the government of the Netherlands Antilles installed the Pourier Commission tasked with investigating the state of affairs of the island government of Sint Maarten in December 1991. Its report concluded that the island was in a severe financial crisis, that rules of democratic decision-making were continuously broken, and that the island government constituted an oligarchy. In short, the island government failed completely according to the report. After long negotiations, the Kingdom government enacted a General Measure of Kingdom Administration (Dutch: Algemene Maatregel van Rijksbestuur) in early 1993, placing Sint Maarten under direct supervision of the Kingdom. Although originally meant for one year, the Order-in-Council for the Kingdom was eventually extended until 1 March 1996. Though much has changed since, allegations of criminal activities continue to plague Sint Maarten. In 2004, the Minister of Justice of the Netherlands Antilles asked the Scientific Research and Documentation Centre (Dutch: Wetenschappelijk Onderzoek- en Documentatiecentrum (WODC)) of the Dutch Ministry of Justice to conduct research into organized crime in Sint Maarten. The report concluded that money laundering and cocaine trade are widespread on Sint Maarten. It also alleged that money from the island was used to finance Hamas, its associate Holy Land Foundation, and the Taliban. In April 2009, former Commissioner Louie Laveist was convicted, and sentenced to an 18-month prison sentence, by the Sint Maarten Court-of-First-Instance, on account of forgery, fraud, and bribery. He was later acquitted of forgery and of fraud by the Common Court of Justice of the Netherlands Antilles and Aruba, but not of bribery. In the 2011 Netherlands Antilles census, the population of the island territory was 33,609. Lower Prince's Quarter (8,143 inhabitants). Cul de Sac (7,593 inhabitants). Upper Prince's Quarter (3,139 inhabitants). Little Bay (Fort Amsterdam) (3,093 inhabitants). English is the day-to-day administrative language and language of communication in Sint Maarten, and the first language of the majority; the government uses Dutch when communicating with the Dutch government and formerly did so with the Netherlands Antilles government. Local signage uses both Dutch and English. The government continues to produce Dutch-language documents. There were English-medium and Dutch-medium schools on St. Maarten, and the Dutch government policy towards St. Maarten and other SSS islands promoted English medium education. As per the 2001 census there were far more Spanish speakers than Dutch speakers; each group was 14.8% and 4.2%, respectively. Thus, Sint Maarten is a polyglot society, they are simultaneous bilinguals in Dutch and English, and among them are speakers of Spanish and French. Linguist Linda-Andrea Richardson stated in 1983 that Dutch was a "dead language" in Sint Maarten. Some residents, including Arubans and St. Martiners who lived in Aruba, speak Papiamento. The official languages are Dutch and English. A local English-based creole known as Virgin Islands Creole is also spoken. An annual regatta is also held over 3 days culminating in the first weekend in March. Among the leading cultural artists of the island are Isidore "Mighty Dow" York, kaisonian, panman; Roland Richardson, Impressionist painter; Nicole de Weever, dancer, broadway star; Susha Hien, choreographer; Lasana M. Sekou, poet, author, independence advocate; Clara Reyes, choreographer; Tanny and The Boys, string band music group. The annual Saint Maarten Carnival starts in April and ends in May. The Grand Carnival parade that takes place on the Dutch side is the largest parade of the island's two carnivals. The annual St. Martin Book Fair takes place during the first weekend of June, featuring emerging and famous authors from the island, the Caribbean region, and from around the world. Ank Klomp wrote in "Saint Martin: Communal Identities on a Divided Caribbean Island" that Sint-Maarten lacked a Dutch cultural identity. Popular team sports in Sint Maarten include baseball, basketball, volleyball, cricket, and soccer. Recreational fishing, golf, and water sports (including diving, kayaking, snorkelling, and yachting) are popular amongst tourists. The Sint Maarten Soccer Association was founded in 1986. The organisation is not a member of FIFA, but became an associate member of CONCACAF in 2002, and a full member in 2013. The national football team debuted in 1989, and plays its home games at the Raoul Illidge Sports Complex, which has a 3,000-spectator capacity. After an initial period of popularity during the 1990s, including an appearance at the 1993 Caribbean Cup, interest in football declined, with the national team playing its last official match in 2000 (against Dominica). However, Sint Maarten is scheduled to return to international competition in March 2016, in the 2017 Caribbean Cup qualification tournament. The Sint Maarten Cricket Association is a member of the Leeward Islands Cricket Association (LICA), which is in turn a member of the West Indies Cricket Board (WICB). With rare exceptions (for instance, the Stanford 20/20), the national cricket team plays only against other LICA members, though Sint Maarteners may go on to play for the Leeward Islands team at regional level and are eligible for both the West Indies and the Netherlands internationally. The primary venue for cricket is the Charles Vlaun Cricket Field. Colin Hamer was the first Sint Maartener to play first-class cricket, while Daniel Doram was the first islander to play at international level, debuting for the Netherlands against Ireland in the Intercontinental Cup in July 2013 at the age of 15, also becoming the first St. Maartener to take a first-class five-wicket haul. In 2016 Keacy Carty became the first St Maartener to play representative cricket for the West Indies (for the West Indies under-19s). Carty was the man of the final at the 2016 Under-19 World Cup, and was later described by the prime minister, William Marlin, as having "brought the name of St Maarten to international acclaim". Prior to cricket becoming popular, baseball was preferred. No national team existed, although Sint Maarteners were eligible to play for the Netherlands Antilles baseball team before its dissolution. Several Sint Maarteners have passed through the American baseball system, playing at college level or in the minor leagues. Allen Halley played college baseball for the South Alabama Jaguars and was drafted by the Chicago White Sox in the 30th round of the 1995 draft, reaching Class A-Advanced in the minor leagues. Three others, Rene Leveret, Marc Ramirez, and Rafael Skeete, were signed as free agents by major league teams during their careers, but played only in the minor leagues. The island is famous for its runway at Princess Juliana International Airport, in which landing aircraft pass within 35 metres (38 yd) of Maho Beach below, due to the close proximity of the runway to the ocean. The planes appear to land dangerously close to beach goers so the beach and airport have become a popular place for people to view aeroplane landings. In July 2017, a New Zealander died from head injuries after being propelled backwards from a jet engine blast. The official languages of Sint Maarten are Dutch and English with a local dialect. Other common languages include various Dutch-based creoles (spoken in neighboring islands), Spanish (spoken in the Dominican Republic and various South American countries), and Papiamento (spoken in Aruba, Bonaire, and Curaçao). Sint Maarten is also known for its festive nightlife, expansive beaches, precious jewelry, traditional cuisines, and plentiful casinos . Previously residents had to complete secondary studies in Aruba and/or Curaçao. Prior to 1976 Sint Maarten had two secondary schools: the government secondary school John Phillips School and the Catholic secondary school Pastoor Nieuwen Huis School. Philips was both a MAVO/ETAO school while Huis was a MAVO school. The foundation Stichting Voortgezet Onderwijs van de Bovenwindse Eilanden (SVOBE), established on February 20, 1974, was created as the neutral governing body for a new school created by the merger of Phillips and Huis schools. MPC, the merged school, opened on August 17, 1976. The Caribbean International Academy, founded in 2003 is a preparatory private boarding and day school on the island of St. Maarten. Catering to children from Kindergarten to Grade 12, CIA is also the only school offering Canadian/Ontario High School Diploma (OSSD) and 90% of their graduates go on to attend universities in Europe, Canada and the United States. Learning Unlimited Preparatory School (LUPS) is an American accredited institution, that established a Caribbean location in St.Maarten in 1991. The school is accredited by the Southern Association of Independent Schools (SAIS) and the Southern Association of Colleges and Schools (SACS). Most residents who attend tertiary institutions do so in Curaçao and/or European Netherlands. The American University of the Caribbean School of Medicine (AUC), founded in 1978, was previously located on Montserrat. Because of the eruption of the Soufrière Hills volcano in 1995, AUC moved its campus to St. Maarten later that year. A permanent campus was completed in 1998 in Cupecoy. 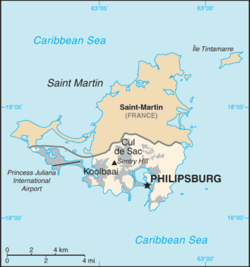 The University of St. Martin (USM) was located in Philipsburg. The University of Sint Eustatius School of Medicine, founded in 1999, was previously located on Sint Eustatius. In September 2013, the University of Sint Eustatius moved its campus to Cole Bay, St. Maarten. Philipsburg Jubilee Library in Philipsburg was the most prominent library in Sint Maarten. However, after Hurricane Irma hit the island in 2017, the library was forced to shut down. As of February 2019, Philipsburg Jubilee Library still lacks the funding necessary for it to be rebuilt, but has recently reopened in a temporary location until further notice . Air transportation to Sint Maarten and the whole island is served by Princess Juliana International Airport, which is well known for its very low final approach landings close to a popular beach at the end of the runway. The Supreme Court of the Netherlands ruled in a well-known case on the jet blast on this beach. Winair (Windward Islands Airways) has its headquarters on the grounds of the airport. There are no railroads on the island. St. Maarten's economy is mostly based on tourism, either from tourists staying on the island or day tourists from the many cruise lines that dock in the Philipsburg Harbour. In 2014, St. Maarten had more gaming machines per resident than any other country in the world. After Hurricane Irma hit the island in 2017, Sint Maarten's economy has decreased significantly. In a 2019 report, it was revealed that the island's GDP dropped by 4.7%, with an increase in inflation. . This drastic hit to the economy was due to lessened tourism, real estate, trade, and business activities..
^ a b According to Art. 1 para 2. Constitution of Sint Maarten: "The official languages are Dutch and English"
^ a b GDP – per capita (PPP), The World Factbook, Central Intelligence Agency. Accessed on 7 April 2018. ^ Sint Maarten joined the North American Numbering Plan on 30 September 2011; it previously shared the country code +599 with Curaçao and the Caribbean Netherlands. "PL-423: Updated Information - Introduction of NPA 721 (Sint Maarten)" (PDF). North American Numbering Plan Administration. 2011-07-27. Retrieved 2011-07-29. Permissive dialing, allowing the use of +599, will be in place until 30 September 2012. ^ Lampe, Armando (2001). Mission Or Submission? : Moravian and Catholic Missionaries in the Dutch Caribbean During the 19th Century. Otto Harrassowitz Verlag. p. 154. ISBN 9783525559635. ^ "ISO 3166-1 decoding table". International Organization for Standardization. Retrieved 2010-12-16. ^ 123-reg Blog - Let's talk about .SX! ^ "Netherlands PM: Death toll from Irma on Dutch Saint Martin rises to four". Retrieved 23 Jan 2019. ^ News, A. B. C. (7 September 2017). "St. Martin's famous airport badly damaged by Hurricane Irma". ABC News. Retrieved 16 September 2017. ^ Davies, Caroline (8 September 2017). "Caribbean islanders fear another battering after Irma wreaks havoc". the Guardian. Retrieved 16 September 2017. ^ "After Irma, fearful islands await Hurricane Jose". Retrieved 16 September 2017. 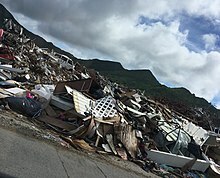 ^ "Third of buildings on Dutch St. Martin destroyed". Retrieved 16 September 2017. ^ TALKS, SXM. "Rutte: We will not abandon St. Maarten - SXM Talks". www.sxm-talks.com. Retrieved 16 September 2017. ^ News, ABC. "The Latest: Irma regains strength to Category 5 hurricane". Archived from the original on 13 September 2017. Retrieved 16 September 2017. ^ "Troops called in to stop looters on hurricane-ravaged St Martin". Daily Mail. Retrieved 16 September 2017. ^ Press, ANIKA KENTISH and MICHAEL WEISSENSTEIN Associated. "After raking Caribbean, Irma gains strength, targets Florida". Retrieved 16 September 2017. ^ "The Latest: Irma regaining strength over bathtub-warm water". Archived from the original on 12 September 2017. Retrieved 16 September 2017. ^ Staff, Our Foreign (10 September 2017). "Hurricane Jose spares storm-ravaged French Caribbean islands". Retrieved 16 September 2017 – via www.telegraph.co.uk. ^ Weissenstein, Anika Kentish and Michael (9 September 2017). "Irma turns Caribbean island paradises into nightmares". Washington Post. Retrieved 16 September 2017 – via www.washingtonpost.com. ^ "Over 1,200 Americans evacuated from St. Maarten amid reports of violence". Retrieved 16 September 2017. ^ News, A. B. C. (12 September 2017). "Royal Caribbean dispatches cruise ships to help with hurricane relief". ABC News. Retrieved 16 September 2017. ^ CNN, Hilary Clarke and Samantha Beech,. "European leaders step up Irma relief effort in Caribbean". Retrieved 16 September 2017. ^ Dutch News, Gordon Darroch,. "Willem-Alexander: Sint-Maarten destruction 'worse than any war zone'". Retrieved 13 March 2019. ^ NL Times, Janene Pieters,. "DUTCH KING VISITS SINT MAARTEN; FIRST EVACUEES ARRIVE IN NETHERLANDS". Retrieved 13 March 2019. ^ SXM Airport (22 October 2017). "SXM Airport Temporary Facilities Operating Smoothly". SXM Airport. Retrieved 20 August 2018. ^ SXM Airport (23 March 2017). "SXM Airport Opens Temporary Arrival Pavilion Friday". SXM Airport. Retrieved 20 August 2018. ^ "GeoHive - St. Maarten population". geohive.com. Archived from the original on 2015-10-25. Retrieved 2015-10-27. ^ a b "Central America and Caribbean ::SINT MAARTEN". CIA The World Factbook. ^ a b c Klomp, Ank. "Saint Martin: Communal Identities on a Divided Caribbean Island." In: Niedermüller, Peter and Bjarne Stoklund (editors). Journal of European Ethnology Volume 30:2, 2000: Borders and Borderlands: An Anthropological Perspective. Museum Tusculanum Press, 2000. ISBN 8772896779, 9788772896779. Start: p. 73. CITED: p. 80. ^ a b Dijkhoff, Marta, Silvia Kowenberg, and Paul Tjon Sie Fat. Chapter 215 "The Dutch-speaking Caribbean Die niederländischsprachige Karibik." In: Sociolinguistics / Soziolinguistik. Walter de Gruyter, January 1, 2006. ISBN 3110199874, 9783110199871. Start: p. 2105. CITED: p. 2108. ^ Klomp, Ank. "Saint Martin: Communal Identities on a Divided Caribbean Island." In: Niedermüller, Peter and Bjarne Stoklund (editors). Journal of European Ethnology Volum 30:2, 2000: Borders and Borderlands: An Anthropological Perspective. Museum Tusculanum Press, 2000. ISBN 8772896779, 9788772896779. Start: p. 73. CITED: p. 85. ^ The St. Martin Book Fair – House of Nehesi Publishers. Retrieved 14 August 2016. ^ ST. MARTIN AND ST. MAARTEN SPORTS & ACTIVITIES – Fodor's Travel. Retrieved 22 February 2016. ^ April 21, 2002: The national associations of Saint-Martin and Sint Maarten were welcomed as the newest (associate) members to the Confederation during the CONCACAF Ordinary Congress in Miami Beach, Florida (USA) "This Week in CONCACAF History: April 17–23". CONCACAF.com (2011). Archived from the original on 30 August 2011. Retrieved 22 February 2016. ^ (Dutch) Sint Maarten - List of International Matches – Rec.Sport.Soccer Statistics Foundation. Retrieved 22 February 2016. ^ "St. Maarten draws US Virgin Islands, Grenada in first round Caribbean Cup". The Daily Herald (Sint-Maarten). 17 January 2016. ^ Carib Lumber Ball Park – CricketArchive. Retrieved 22 February 2016. ^ Colin Hamer – Biggin’ Up We Island. Retrieved 22 February 2016. ^ (21 December 2015). "Carty on WI U19 team for Youth World Cup" Archived 2016-03-02 at the Wayback Machine – 721 News. Retrieved 14 February 2016. ^ (19 February 2016). "Keacy Carty gets a fitting hero’s welcome" – Today (Sint Maarten). Retrieved 22 February 2016. ^ (5 September 2009). Netherlands Antilles reveal final Baseball World Cup Roster – Mister Baseball. Retrieved 22 February 2016. ^ St. Maarten, Netherlands – The Baseball Cube. Retrieved 22 February 2016. ^ ". "Sint Maarten DUTCH DEPENDENCY, WEST INDIES"
^ "."St. Maarten information - Culture and Tourism"
^ a b "School Directory ." Sint Maarten Government. Retrieved on February 28, 2018. ^ a b "History." Stichting Voortgezet Onderwijs van de Bovenwindse Eilanden. Retrieved on March 3, 2018. ^ "History Sundial School." Stichting Voortgezet Onderwijs van de Bovenwindse Eilanden. Retrieved on March 3, 2018. ^ "Caribbean International Academy :: Top Boarding & Day School in SXM". Caribbean International Academy :: Top Boarding & Day School in SXM. Archived from the original on 2015-08-11. ^ "." Caribbean Network. Retrieved on March 12, 2019. "Library on Sint Maarten still closed: ‘Everyone has good intentions, but nothing is happening’"
^ "." Philipsburg Jubilee Library. Retrieved on March 12, 2019. "Jubilee Library to reopen in temporary location Monday"
^ Lazo, Luz (7 Sep 2017). "Irma devastates world-famous St. Martin airport". Washington Post. Retrieved 25 December 2017. ^ Buckley, Julia (13 Jul 2017). "St Maarten: Tourist Killed by Jet Blast at Notorious Caribbean Airport". Independent. Retrieved 25 December 2017. ^ "Directory: World Airlines." Flight International. 30 March–5 April 2004. 96. ^ "The World Count of Gaming Machines, 2014" (PDF). Archived from the original (PDF) on 2015-12-08. Retrieved 2015-10-19. ^ ". "Curaçao, St. Maarten economies contracted"
^ ". "Curacao and St Maarten Insurance Industry Governance, Risk and Compliance Report 2019"
Gert Oostindie and Inge Klinkers (2001) Knellende koninkrijksbanden: het Nederlandse dekolonisatiebeleid in de Caraïben, 1940–2000. Amsterdam: Amsterdam University Press. Joseph H. Lake, Jr. (2004) Friendly Anger - The rise of the labor movement in St. Martin. St. Martin: House of Nehesi Publishers. https://www.amazon.com/Friendly-Anger-Labor-Movement-Martin/dp/0913441414. Lasana M. Sekou, ed. (1997, Third printing) National Symbols of St. Martin - A Primer. St. Martin: House of Nehesi Publishers. Louis Duzanson (2000, 2004) An Introduction to Government - Island territory of St. Maarten. St. Martin: House of Nehesi Publishers. https://www.amazon.com/Louis-Duzanson/e/B001KMLHEA/ref=dp_byline_cont_book_1. Richardson, Linda-Andrea. "The socio-linguistic situation in St. Maarten." In: Carrington, Lawrence D. (editor). Studies in Caribbean Language. Society for Caribbean Linguistics, 1983. p. 63-69..
Rhoda Arrindell (2014) Language, Culture, and Identity in St. Martin. St. Martin: House of Nehesi Publishers. http://www.spdbooks.org/Products/9780988825222/language-culture-and-identity-in-st-martin.aspx. Wikimedia Commons has media related to Sint Maarten. House of Nehesi Publishers (book publishing/research/PR foundation). "Sint Maarten". The World Factbook. Central Intelligence Agency. This page was last edited on 30 March 2019, at 19:46 (UTC).